My son's friends had gifted him with a delicious chocolate mousse cake from Red Ribbon on his birthday. 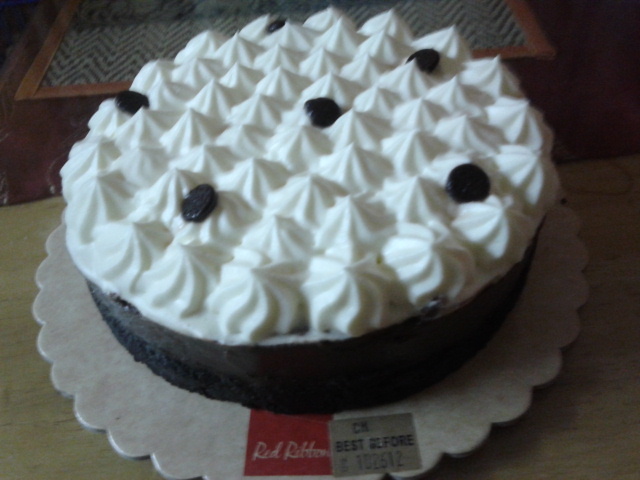 This is my first time to try chocolate mousse as I had always been loyal to Red Ribbon's Mango Cake. I have to say sorry to Goldilocks as I am now officially shifting to Red Ribbon for our cake requirements at home. 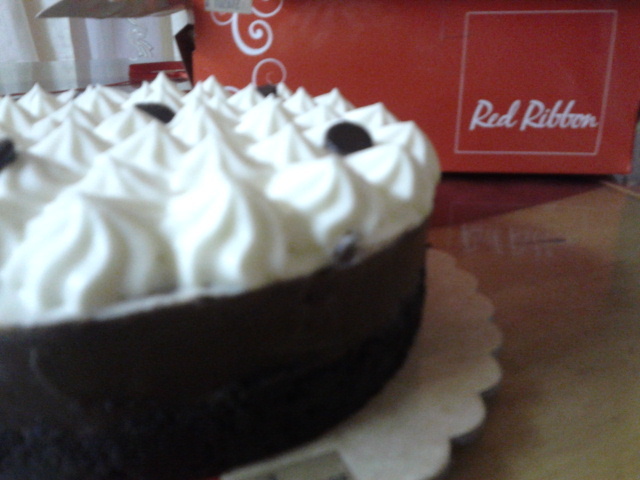 I love the taste of most Red Ribbon cakes and breads. This Chocolate Mousse cake is a bed of rich chocolate pound cake topped with yummy cream based mousse and chocolate chips. Really yummy! Great for coffee or tea. One fine afternoon while my daughter Mika was at Tagaytay for her school retreat, me and my son Edmar out of boredom, decided to try baking cup cakes which we haven't done yet before. So please bear with us as you see the outcome (lol). We actually decided to just make use of whatever is available in our cupboard. So we made use of the chocolate cake mix with some eggs and butter. I know these cup cakes look horibble! Hahaha. See the design? Really amateur, huh? But anyway, the taste was nice. So I guess, what we need to concentrate more is how to apply some frosting and I think after more practice, we'll make better looking cup cakes next time. One thing nice about having a vacation at home is that I had the opportunity to watch all the videos created by my daughter for her school projects as well as those that she has entered into competitions. I feel happy that she's doing very well in this field and I wanted to support her by letting her pursue what she has started. I actually thought of having an instant voice over booth in the house that she can use for the voice over and dubbing. I think this can be fabricated by just creating a small space and cover it with wall panels, then install a soundproofing foam. I think this can be bought in music shops or can be ordered online. I feel blessed to have talented children. As a parent, we always wanted to see our children happy and fulfilled. I believe that it is very important for parents to give their children a moral support. This way, they would feel inspired to pursue their ambitions knowing that in the midst of success or failure, there is always someone who will be there to cheer them up when they succeed and a hand to lift them up when they failed. My son's birthday is fast approaching. It's going to be next week. I'm planning to give him a little celebration with just us and few of his close friends. He actually requested to make a simple one for him this year. Maybe I'm just going to prepare some usual dishes for his friends. I'm not yet sure though on what I am going to prepare for him as we haven't finalized everything yet. As for the birthday gift, I guess there's nothing that could excite him more. I had given him a number of "pasalubongs" when I arrived home and he almost had everything that he needs. I almost thought of buying him sidi boots but I finally dropped the idea as I'm sure that he's not going to wear it anyway. No, not at this time. But at any rate, whatever I would give him, I'm pretty sure that he will surely appreciate. He's a very simple and nice boy and he never considered himself a "spoiled brat". We had purchased a big bottle of shampoo for him, a pack of flavored chewable bones, an absorbent dog towel and a new pair of feeding dish. Lucky Lucio! :) We are also on a look out for some basic tools needed in the house but we could only find a limited supply in that shop as far as tools is concerned. I thought it is something similar to the Free port Exchange where there is a section for car accessories as well as a section for home supplies like the basic tools, screws, door knobs, hinges, and even flat washers. Sometimes, I feel that it is better to go to a one stop shop to get all the items that we need without going through a lot of stores thereby saving your time and effort. Anyway, we went to Japan Home Center because my son wanted to show me around the newly constructed mall at Subic Bay Free port Zone. I also got curious as I haven't visited the place yet so I just followed my son's suggestion. As expected we did not went home empty handed. We were able to get some basic stuff for the house. I used to check on our storage cabinet every time I'm back home to see if there's anything there that I need to replenish. This is one of my typical day at home. I was very happy with how my flight went through. I've never encountered any hassles of any form since I left my apartment in Cambodia until I reached Siem Riep Airport. Everything went through as scheduled. Even my taxi ride from my work place to the airport was a bit faster than usual. I'm really thankful that I didn't encounter any problems along the way, considering that it was my first time to travel to Siem Riep. I didn't know the taxi driver at all and I was praying really hard while inside the taxi and thanks God, I had a safe road trip to the airport considering that it was raining that time. My check in process in the airport was also fast and smooth. In fact, I still had the time to roam around to check on it's facilities and to even take my dinner at one of the restaurants. I reached Manila as scheduled and everything went through smoothly until I reached my house. Back home, I was able to had a good lunch especially prepared for me by my son and our house helper, Ate Elsa. I actually requested them to cook for me "beef nilaga" and "inihaw na bangus". It was really a nice lunch on my first day at home. My son also bought for me my favorite mango cake from Red Ribbon which I took later on for my "afternoon high tea". One of my plans on how am I going to spend my vacation here in the Philippines is to find some activities at home where I could bond with my kids. Of course, movie marathon is on the list of my priorities as all of us love to watch movies. But aside from this, I am looking into organizing some table games at home like playing scrabble and monopoly. I'm sure that it will be lots of fun. As I was surfing the net, I also came across this exciting fun game, japanese puzzle box. This puzzle box requires some tricks or manipulations in order to open it. This is where the fun begins. It consists of some moves and various twists to trick any person who would try to open the puzzle box. This is actually new to me but it sounds exciting. I would be scouting for some table games at the local book store or game shops so we could start with our bonding activity soon. Anymore suggestions? I would be pleased to get new ideas. Just a quick post to release my excitement on my forthcoming vacation. Yes, you heard it right, I'll be home once again! I was home last March of this year and after six months of working here, I will get to see my home sweet home again. I'm almost done packing my things and fixing things in my room. I'll be on vacation for 28 days and I am looking forward to spend some quality time with my family. I hope that I would be able to do all our plans. I have lots of things to do at home as well, and I hope that my month long vacation is enough to attend to all the things that requires my attention. My kids had already planned where they would want us to have our routine "dine outs". My kids and I love foods, so this has been the number one in our list (lol). But I already told my kids that I would also love to spend some quiet times at home where I could cook and bake for them. I also wanted to spend time with my Mom at home as she always opposed going out. So to get even with everybody, I have to balance my time. Besides, I am much domesticated when at home. I love to do some general cleaning, decorating, fixing the cabinets and pantry and all those usual stuff. And oh! I have to check on my garden, too. There's also our dear little "Lucio" who would definitely entertain me at home when kids are in school. Lucio is our pet Shih Tzu and he is getting more adorable now, so I'm pretty sure that I would enjoy staying with him, too. I have to wait till March of next year to have a great time with the whole family. My husband might be having his annual leave too that time so I am looking forward to have a great time with the whole family. Four days more to go and it's going to be fun, fun and fun! !